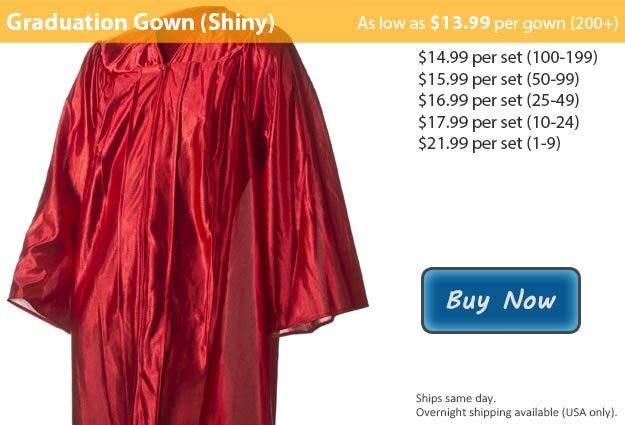 Shiny red graduation gowns are a breathtaking choice for your graduating class. Here at Honors Graduation we have all of your graduation needs to ensure that this monumental day in your life goes flawlessly. Graduation is a time of celebration, when your family and close friends all come together to honor your success and show their support for your future goals. You have worked long and hard to reach this point and your dedication has not gone unnoticed. I'm sure that in addition to the many obstacles obstructing your path, you were able to meet some new friends that may have helped you get through your struggles. Thanks to your maximum efforts and constant determination you were able to overcome all of the challenges you were faced with, proving that anything you set your mind to is possible no matter how difficult it may seem. With graduation just around the corner we can help you with all of your wardrobe requirements. Students who are graduating wear a graduation cap & robe at the time of their ceremony, typically accented by either a graduation cord or tassel. Our shiny red graduation robes are a stunning option. Red graduation gowns are usually worn by students who have earned their degree in communication or journalism but it is not uncommon for students to wear robes matching the color of their school as well. At Honors Graduation we have a large variety of graduation gowns. In addition to the many robe color options that you can choose from, each of our shiny color choices is available in a matte finish as well. Our Cap & Gown + Tassel deal is perfect for quick and easy shopping, it includes your graduation robe and the matching cap, plus we'll throw in a tassel of your choice at no additional cost. Our gowns are also available for separate purchase and come in sizes ranging from 24-66 including several plus sizes. Whenever you buy your graduation cap from us we will add the tassel you select to your order for free! This graduation robe is also available in Red Matte Fabric.